Kūkai 空海 (774–835) is famous for founding the Shingon lineage of Buddhism in Japan, but he also can be noted as having introduced for the first time into Japan the system of primarily Indian astrology compiled by Amoghavajra (705–774) as the Xiuyao jing 宿曜經 (T 1299) between 759 and 764 in China (see here for details). Kūkai brought back with him a copy of said text in 806. His biographical materials, the Kōya Daishi go kōden 高野大師御廣傳 and Kōbō Daishi go den 弘法大師御傳 (in the Zoku gunshoruijū 續群書類從 8), record that contemporary Japanese calendar experts were unaware of the concept of Sunday and the related astrological calendar until Kūkai introduced it. This suggests that between 764 and 806, Amoghavajra's system of astrology had rapidly become accepted in Buddhist circles in China and by the time Kūkai had arrived for his two year stay it was considered essential to Buddhist practice, or at least in Mantrayāna it was. When he returned home he had to explain the significance of not just the reoccurring cycle of 27 nakṣatra-s or lunar stations (see here), but also the seven day week in its modern ordering, which was originally Hellenistic with Egyptian elements, having been transmitted to India and thereafter to China. The seven weekdays … If you suddenly forget, just ask a Hu [Central Asian], Persian or Indian as they all know. Hindus and Manicheans always maintain a fast on Sunday. The Persians also regard this day as a great day. These matters are not forgotten. Simultaneously in Christian Europe, of course, Christians likewise attended Church and rested on Sunday. Buddhists in China were late adopters of this custom which interestingly highlights the extent to which occidental astrology, with its origins in Babylon, influenced multiple civilizations. The seven day week and 27 nakṣatra-s are coordinated and when certain nakṣatra-s land on certain days of the week it is deemed either auspicious or inauspicious, which is believed to have a direct impact on the efficacy of rites and mantras. This is why Kūkai insisted Buddhists in Japan acquaint themselves with this schedule. There is a record of some of his oral instructions preserved as the Hino'o kuketsu 檜尾口訣 (T 2465) by his disciple Jichie 實慧 (786–847) of Tō-ji 東寺 in Kyōto. There are recorded instructions for intercalary months (an extra month added for adjustment purposes on the lunar calendar) and short months (29 day lunar months) based on the aforementioned Xiuyao jing. The first part is as follows. Inquiry concerning which nakṣatra-s to use during an intercalary month and method for allocating nakṣatra-s for missing days in a lesser month. Recorded according to oral instructions. When there is an intercalary month, the constellational convergences of the true month repeat themselves in the intercalary month. Supposing month 12 has an intercalary month, the constellational convergence of day 1 of month 12 will be Dhaniṣṭhā, the constellational convergence of day 15 will be Maghā and the constellational convergence of day 30 will be Maghā [=Pūrvabhādrapadā]. Like this the constellational convergences of intercalary month 12 will be identical. There are no differences. The preceding month is the true month 12. The intercalary month is the accompanying month 12. Hence the constellational convergences and 30 days of the accompanying month all use the constellational convergences of the true month 12 without any different nakṣatra-s. The other months can be understood according to the month. 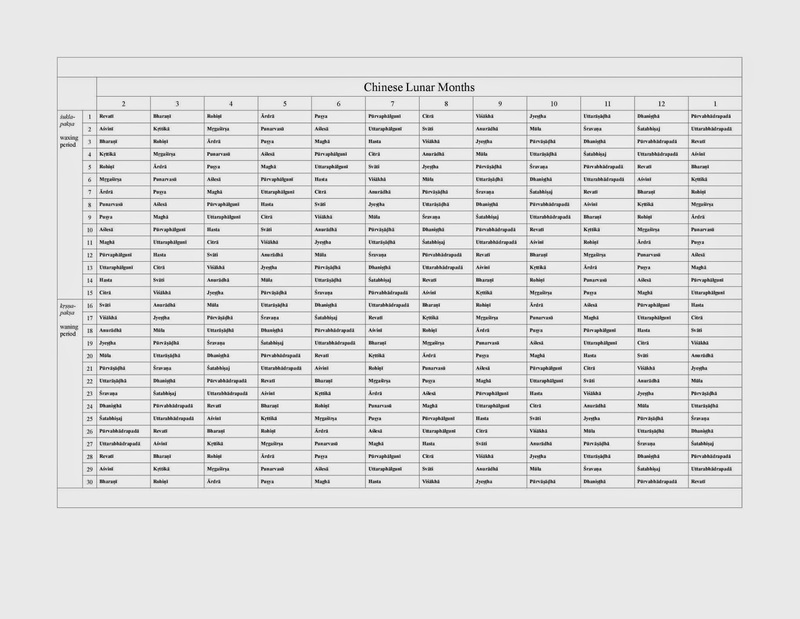 On the right is a column for lunar month 12. We see that 12/1 is Dhaniṣṭhā, 12/15 is Maghā and 12/30 is Pūrvabhādrapadā. Magha stated as lunar 12/30 is in the oral transcript is probably a scribal error. Kūkai is stating that the 30 day sequence from Dhaniṣṭhā to Pūrvabhādrapadā will be identical to its preceding month if an intercalary month occurs. This is basic rule, but is not immediately apparent looking at Amoghavajra's text. Method for selecting the constellational convergence on the missing thirtieth day in a lesser month. Now suppose month 1 lacks the 30th day. Even without that 30th day, that day still has a constellational convergence. The first half of the first day of the following month 2 is assigned the constellational convergence of the missing day in month 1 while the second half is that day's constellational convergence. Hence even if there are fluctuations with the days, in the case of a lesser month lacking a day, the converging constellation will always apply to a day. The actual constellation of day 1 in the following month does not change. This appears to be an innovation, which might be something Kūkai learnt in Chang'an. It is not apparent in Amoghavajra's table which possibly accounts for short months by repeating the same nakṣatra on two days. For example, lunar 2/30 and 3/1 are Bharaṇī. No version of Amoghavajra's text I have surveyed mentions splitting a day and assigning each part to a different nakṣatra, though the text does mention how an auspicious time will only apply for half a day or half a night. Kūkai's instructions here ensure that the sequence of nakṣatra-s is not interrupted, which preserves the alignment with the Chinese lunar calendar. Presumably this also means if someone is born on such a split day their birth constellation would be determined by in which part of the day they were born, though this is not stated. The table in any case is strictly comprised of twelve thirty day months, which makes for easy conversion. However, a Chinese calendar (there were actually eight different ones in the Tang period alone) might adjust things to ensure for example that the new moon strictly falls on the first day of the lunar month, which allows for strict calibration of the days to the lunar cycle. Amoghavajra would have been aware of this as his staff included calendar experts. This may or may not end up with the table misaligned with the Chinese calendar, though at the very least lunar 15 is supposed to be the full-moon and fall on twelve specific nakṣatra-s from which the twelve Indian month names are derived, though in reality it can vary ahead or behind by up to a day (i.e., there is the true full moon and the nominal full moon). It should be noted that the table was eventually considered unreliable by some in Japan since it does not necessarily reflect which nakṣatra the moon is in on a given night as it can sometimes predictably be ahead or behind it (the text actually accounts for this and describes it like a calf either being ahead or behind its mother). The table seems based on arithmetical principles rather than being observational and reflects one version of an Indian model where each lunar station (nakṣatra) is assigned equal space on the ecliptic, whereas the perhaps older model has the nakṣatra-s of differing lengths measured by time (muhūrta-s each comprised of forty-eight minutes), which is observational in principle. In other words, their differing lengths are determined by how long it takes for the moon to pass through their assigned space. The table became less essential in the tenth century when Japanese Buddhist astrologers received from China advanced calculation methods which could identify the positions of all the planets (sun and moon included) on any given day since at least the year 660 when the particular calendar they used was set to start (the Futian li 符天曆), meaning they could identify exactly where the moon was when someone was born rather than relying on Amoghavajra's streamlined table. This was essential for the Greco-Indian system of astrology they practiced as they compiled natal charts that needed to display where all the planets were at a given point in time, but this system was being translated into Chinese around the time Kūkai was in China and it seems he was unaware of it. Incidentally, Ennin's 圓仁 (794–864) biography the Jikaku Daishi den 慈覺大師傳 (Zoku gunshoruijū 8) likewise records him in 849 following it, showing its importance to early Taimitsu 台密 and highlighting how both esoteric lineages in Japan took great interest in astrology from early on. In an upcoming post we will explore in detail the development of Buddhist astrology in Japan after Kūkai.